It’s the time for giving gorgeous fresh cut flowers to a dear friend and to enjoy yourself at your desk, near the kitchen sink or best of all, on your bedside table. 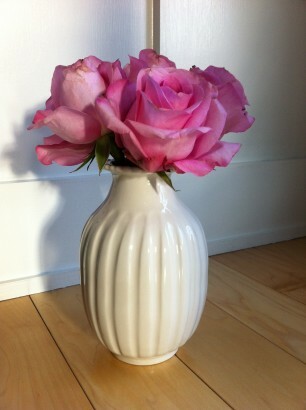 So, it is only fitting that you have a vase that gives your lovely blossoms their due. I have found just that perfect vase. Actually, I found several all from the same designer, the eponymous Frances Palmer. I am completely smitten with her work and I am not alone. Much has been written about her including extensive pieces by Martha Stewart, Design Sponge and Dominique Browning’s Slow Love Life blog among several others. Frances’ is not only an amazing designer with a keen eye for just enough ornamentation, form and style, she is also sensitive to her customer’s needs making the shopping experience easy and enjoyable. Treat yourself, treat your friend…and oh so pretty.